Post-construction damage to mature trees is common, whether it is from a new home, new addition, or smaller projects like patios, driveways and even irrigation systems. They all can impact the health of mature trees by disturbing or damaging their root systems, as a result of digging and compacting the soil around them. The important thing to remember with mature trees is that rarely will the signs of damage show up immediately after it has happened, unless it is very severe. It can take years to surface, and when it does, people don’t often associate it with the real cause. I have seen old oaks that have been holding on for fifteen or twenty years after the damage was done. The reason for this is that large trees have tremendous ability to store food for tough times such as drought or early frost damage to new leaves. When this occurs the tree will turn to its reserves for the food it needs. If a tree’s root system is damaged, the tree must turn to those same reserves to survive until it can repair and replace the damaged roots to get nutrient and water uptake back to normal. If growing conditions are good and environmental pressures are low, it should recover without many problems, depending on how severe the original damage was. If the tree was in bad shape to begin with or has too many environmental pressures like drought, insects or disease, the odds of long-term survival decrease after construction. The species of tree also plays an important role in determining a plan of action to ensure success during and after construction. Some trees, like oaks, elms and locust are quite tolerant of disruption, but other trees such as beech and cherry can be very sensitive to even moderate change. Too often an arborist is called in after construction to try and “fix the trees” after the damage was done, and the process of trying to get an accurate account of activity around the tree begins. What was the original grade level of the soil? Where were trenches dug for utilities? What time of year did this take place? Where were heavy pieces of equipment, bricks and other building supplies placed? And the list goes on. Once all the information is collected and sorted out, a determination can be made as to the tree’s chances for long-term survival or if the owner will just be delaying the inevitable. If the only option is to temporarily extend the life of the tree, the owner needs to determine for how long and if the money spent to do so is worth the end results. Out of desperation, many homeowners will unfortunately spend more money after the damage has been done “to save the tree” than they would have if they contacted someone in advance qualified to help plan out the construction project before it started. Many homeowners have had greater success in preserving trees through the inclusion of incentives in the building contract for the protection of their trees. Educating and informing all of the building employees on the site and enforcement of the agreed upon rules will go a long way to help ensure tree survival. You need to determine how to keep disruption to the root zone to a minimum. The 3 most important factors are soil compaction, trenching, and grade changes. If you need to trench near a tree for a foundation, a minimum of 4 to 5 feet is required from the base of the tree and if it is possible, bridging the foundation with an I-beam near the tree is an option. When trenching for utilities, try to have all of them placed in the same area as far away from the base of the trees as possible. If you can’t avoid the placement near the trunk then boring under the root zone is an option that will greatly decrease the damage to the roots. This is important even during the installation of irrigation systems. Grade changes are common but can be minimized to avoid burying the roots or scraping them away when removing soil. Removing soil is much more damaging than adding it. Most of a tree’s root system is found in the first 12 inches of soil, with the majority of the feeder roots in the top 6 inches. These are the roots that absorb water and nutrients. The myth that trees have these massive root systems that go down as deep as the tree is tall is false. They do have anchor roots and tap roots that can go relatively deep, but by far the majority of the roots are near the surface. Removing as little as 6 inches of soil over a large area of the root system can cause a lot of damage. Adding soil can be just as bad, but it tends to be less of a shock because the change takes longer to impact the tree. If more than 12 inches of soil must be placed over the root system, a tree well and ventilation system should be installed at the existing grade before adding soil. The deeper the soil, the more ventilation will be needed. Many people install the wells, but neglect the ventilation system that will buy time and aid in the development of new roots in the new soil. By allowing air and water to get down to the original grade and gases to get out, you give the tree a big advantage for long-term survival. To minimize stress, try to keep added soil to a depth of less than 6 inches if possible. Soil compaction is still the most common construction problem around trees in our area. Our heavy clay soil can easily be compressed (especially when wet) so that most of the air pockets are eliminated. When it hardens, it is like cement, making root growth and water absorption next to impossible. It takes a long time for the soil to recover and a lot of trees will run out of reserves before the soil improves. There are some things that can be done to lessen the compaction after construction, but preventing it in the beginning is the key to keeping your plants healthy. Keep heavy equipment and supplies away from root zones and make the areas of activity around the site large enough to get the job done, but keep disruption to a minimum. Examples of this would be establishing a zone to store supplies, setting a path for equipment and trucks to enter and leave the property, placing fencing around root zones, and mulching the root zones heavily. If a root zone cannot be avoided, then using old tires, plywood and a foot or two of mulch to minimize the compacting in that area is a great solution. The time of the year can be important also – winter is the ideal time for construction to proceed around sensitive plants, while spring and early summer are the worst times. Some quick do’s and don’ts to remember: Do repair all damaged roots by making clean cuts that will heal quicker than jagged, torn roots. Don’t allow the cement out of trucks and equipment to be rinsed on site near the root zones of trees – cement is very alkaline and when leached into the soil, can cause pH shock in many plants. Don’t allow trucks to be parked under the trees. Do consult a certified tree care professional prior to construction. Don’t fertilize construction-damaged trees the first year. There are many variables to these recommendations and there are always exceptions to the rules, such as time of year, health, species, and the size of the tree affected. For example, smaller trees adapt easier than large trees, and this becomes crucial in deciding which trees to try to preserve and which to remove before construction. Hopefully, I have made you more aware of the limitations trees have when it comes to construction around them and, in turn, helped save a few trees from demise. Just because they are alive when the construction is finished does not mean they will stay that way in the long haul. Be wise and plan ahead! All of us who deal with plants – big or small, annual or perennial, flowers or foliage – have one thing in common. Working with the soil in which they grow. It is often the most overlooked aspect of the garden for new gardeners and the most cherished aspect for seasoned gardeners, who have grown to appreciate the value of good soil. It quite simply is the difference between success and failure for many gardens and can be the difference between the pleasure of gardening and the tediousness of work. Many of you are familiar with terms like soil structure, pH, humus, etc. But what do these terms really mean and how do they effect our efforts to improve or maintain our soil’s fertility? Let’s start by looking at pH. Most people understand it as whether the soil is acidic (less than 7.0), alkaline (more than 7.0), or neutral (7.0), and that different plants prefer different ranges, but why? In different pH’s, nutrients move at different rates through the soil. The more acidic the soil, the faster the rate. If a plant is acid-loving and is in alkaline soil, it will not get nutrients at a fast enough rate. Fertilizer in this situation would have no effect because it is not a matter of whether the nutrients are present, it is the rate at which they are available to the plant. Now, if you need to raise or lower the soil pH for a particular plant, you will need to understand cations and how they affect your ability to change the soil. Cations are positive-charged nutrients in the soil. The most common, in order, are calcium, magnesium, potash, sodium and hydrogen. Calcium is the most important nutrient in your soil and its proper balance to all others is vital since it helps regulate the soil’s pH. Here is why. All nutrients either have a positive or negative charge, and in nature the normal flow of electrical charge is from positive to negative. All clay and humus particles carry a negative charge on their surface which attracts desirable and/or undesirable positive-charged nutrients or minerals to them. If in proper balance to calcium, the clay and humus will keep these nutrients loosely held in a soil solution, which means the nutrients are readily available to the plants’ negative-charged root tips. The measurement of this exchange is called the Cation Exchange Capacity or CEC of the soil, and is measured on most soil tests. CEC is important in determining how easy it will or won’t be to change your soil pH. A high CEC will make it difficult to change. In a poor soil, for example, as soon as you obtain the proper pH, you then increase the CEC by adding organic matter or humus to the soil. This will increase the amount of negative-charged particles in the soil and help “lock in place” the pH by making it more difficult to change. So, if you are preparing a new soil area, your first concern is the pH. It is critical that you make all adjustments to the pH prior to adding organic matter. While organic matter raises the CEC, salts in the soil are the enemy to proper CEC. All commercial or synthetic fertilizers contain salt; this is how they bind the nutrients together. Every time you add one of these to your soil, you are adding salt, which in turn lowers the CEC. They lower it by using up all the negative-charged particles in the soil and, as a result, the positive-charged nutrients just leach away. This increases the need for more frequent fertilizing, which in turn adds more salts to the soil, and thus begins a vicious circle that many gardeners fall into. This is why the use of organic fertilizers is beneficial. While it is true that plants cannot tell an organic nutrient from a synthetic one, the soil can. The additives in synthetic fertilizers cause problems for the soil as a whole and a lowered CEC is just one of them. If you have a poor CEC and lots of salts in the soil, then odds are you have compaction also, which limits root growth and the flow of water and air through the soil. This decreases the activity of beneficial soil microbes and increases the activity of pathogens in the soil, which in turn causes diseases and so the vicious circle continues. Humus is one of the keys to breaking this cycle. Humus (or “finished compost”) is organic matter that has been broken down by soil microbes as much as possible. These microbes in turn produce ideal nutrient storage for our plants. Humus can hold 3 to 4 times more water and nutrients than clay alone. It helps store water in the soil for drought periods as well as nutrients that plants can readily absorb as they need them. This holding capacity will help reduce the leaching of nutrients out of the soil and lessen the need for additional fertilizers. Humus also helps reduce soil erosion. For example, an acre of soil with only 1 percent humus can only hold less than 1/2 inch of water; any more rain than that will simply erode the soil. However, if the humus content is increased to 6 percent, that acre will easily hold over two inches of rain in the same soil. For those of you having drainage problems, this is something to consider. Soil microbes are the keys to producing humus – if they are not present in sufficient numbers, then all organic matter in the soils stays in its original form or takes much longer to break down into humus. It takes many different types of microbes to accomplish this and they do so in a very systematic fashion. To get an idea of how many organisms there are in the soil, at a depth of 1 to 3 inches in good garden soil, there will be on average 9,750,000 types of bacteria, 2,080,000 types of Actinomycetes (organisms classified between bacteria and fungi), 119,000 fungi, and 25,000 algae in a single gram of soil (Microbiology: An Introduction, 4th edition). These numbers drop rapidly as you go deeper in the soil, but remain pretty high until about 18 inches in depth. If you live in a newer subdivision, most of the beneficial microbes left with the topsoil that was probably scraped off the land before construction started, and the remaining ones were severely reduced by the soil compaction that followed during construction. This is a problem for many gardeners and up until recent times most of the research was focused on nutrients and soil structure alone. In the last 10 to 20 years, the focus has shifted to the beneficial organisms that make up a living soil. By getting back to soil basics, we can be much more successful in our gardening pursuits by increasing our soil’s fertility. To correct problems we need to focus on the soil as a whole and stop looking for that one “miracle solution” that will supposedly give us healthier plants. The soil is a vastly complex environment. It can be, and often is, damaged in many ways that need different solutions to help correct each of the individual problems. The terms we discussed should help put you on the right track. Start by doing a soil test to determine your soil’s pH and CEC. Then adjust the pH as necessary, add humus to raise the CEC, reduce or eliminate the use of synthetic fertilizers, and fine tune from there. Good luck! Steve Turner, Certified Arborist, is from Arboricultural Services in Fenton, MI. Spring and fall are both great seasons for planting trees and shrubs. I know you have all read the pamphlets and have probably done it a few times, but it never hurts for a little review. If I had a dollar for all the improperly planted trees I have seen over the years, I would be rich! First, dig the hole as deep as the root ball and at least twice as wide. Be sure to not dig too deep; a good way to prevent this is to measure the root ball against the shovel handle and check it often when digging. If you do dig too deep, remember to pack the soil firmly under the ball to prevent settling once the plant is in place. This is more important for trees than shrubs. On the other hand, if the hole is not deep enough, keep digging. Don’t make the mistake of planting high and then mounding soil up the root ball, even in clay soils. One exception is a compacted clay subsoil, which can be found in new subdivisions. If you can’t dig deep enough, then add a lot of topsoil around the top of the root ball to make a gradual decline down to the grade level. After the tree is in the hole, cut and remove as much of the wire cage (if present) as possible. Any part that you can’t remove should be cut and bent down. Untie the twine around the trunk and pull down the burlap. If the burlap is in good condition, push it to the bottom or cut it out. If it is old and roots are growing through, then leave it and make several vertical slices instead. If you are planting potted shrubs, carefully remove them from their pots and make several vertical slices down the root ball. Grab the bottom of the roots and pull them back up like peeling a banana and set them in the hole with the cut sections pointing out. Next, begin to backfill using the same soil that came out of the hole, making sure to break up any large chunks of soil. Stop and firm the soil as you go. Stop about 6 inches from the top and add fertilizer to the remaining fill, preferably either slow release or organic fertilizer that is low in nitrogen. Complete backfilling to grade level. When planting trees or large shrubs, do not mix soil amendments such as sand, peat, or topsoil to the fill. These work better as top dressings. They actually create a false environment within the planting hole and do not encourage outward growth of the roots. Instead, the roots tend to wind around in the hole, which can eventually lead to girdling roots. Also, drainage can be a problem with dissimilar soils. Water will not move from one soil type to another until the first is completely saturated. This is why it is important to check the soil of the root ball before you buy the plant. Ideally, you should not plant trees grown in sand in clay soils and vice versa. It will only cause problems in the future. Now that the plant is in the ground, water well and keep the soil moist for several weeks, but do not overwater. Before watering, move aside the mulch and feel the soil to verify it isn’t too wet before adding more water. Keep the mulch away from the base of the plant and do not add too much mulch — 3 to 4 inches is fine. Mulching is one of the best things you can do for your plants if done right, but too much or improperly installed mulch can be a real problem. The common practice of mounding mulch against the trunk has proven to be a fatal one for many trees. These often seen “mulch volcanoes” are perfect circles 8 to 10 inches thick piled against the trunk and are actually creating more problems than they are solving. What makes the problem worse is that many of these trees are on commercial properties under professional care, and this has helped create the false impression that this is the proper way to mulch trees. Homeowners see this and imitate the practice on their own trees. The neat, clean appearance it gives a landscape is appealing to many. In fact, I have had several customers over the years ask me if there is a mold they can buy to make these volcanoes on their own trees! So in our quest for a beautiful landscape we are unknowingly sacrificing the health of the trees in the long run. Why does it harm trees? The bark on the roots of a tree is much different from the bark on its trunk or branches; it is able to tolerate moisture as well as the lower oxygen levels in the soil. The above-ground portion of the tree, which starts at the root flares, has bark that contains tiny openings which are used to release gases and toxins from its system. On plants such as cherry trees or forsythia, these sites are easily seen as tiny white dots or dashes on the bark and are called lenticels. Because of this important function, a tree can’t tolerate soil or mulch placed above its root flares. The lack of air and the presence of excess moisture prevents natural respiration from the bark and causes a build up of gases and toxins in the bark tissue. If soil or mulch disrupts the respiration of the bark, the tree will usually respond in one of two ways. On thin-barked, young trees or species with naturally thin bark, like beech or linden, this disruption causes cankers (wounds) on the trunk. These appear as areas of dead tissue and provide an opportunity for decay to enter the tree. Other species will react by sending out additional roots from the trunk. These roots often end up circling around the trunk and become girdling roots in the future. Researchers are now finding out that trees with girdling roots and excess soil and mulch build-up are much more prone to snapping off at the base in wind and ice storms. The longer the problem exists, the more damage occurs, and the chances of correcting it go down. Note that all trees will not respond in the same way – species, age, and health all need to be considered when trying to evaluate the effects of past damage. Most willow trees, for example, are very adaptable to a change of grade and often will show no problems at all. If caught soon enough, it can be corrected and tree will recover. However, upon root crown inspection, if it is found that large cankers have formed and decay is present, or if the tree has developed extensive girdling roots, it might be wiser to remove and replace the tree than to attempt to save it. During the root crown inspection, arborists use a high pressure air device called an “air spade” to safely remove the excess soil and mulch without damaging the root system. Once the soil is removed, there is a clear view of the buried trunk and roots, the damage can be evaluated, and a decision made as to which roots to leave and which can be safely removed. It is very important not to remove too much too soon or the tree will be shocked. Sometimes the work will have to be done in stages over a couple of years. While it is common to see 4 to 6 inches of mulch around a tree, this is usually too much. I would suggest 2 to 3 inches placed in a ring around the tree with the center around the trunk empty, kind of like a doughnut. How wide to make the ring is up to you, but the farther the better. Trees don’t like to compete with lawns for nutrients and water, and the more mulched area you can give them, the better off they will be. Mulched trees have fewer problems than trees growing in lawns. Even a small, 2 to 3 foot ring can make a big difference. The mulch creates a more natural growing environment with its organic material breaking down and supporting vital soil microbes. Other benefits include increased moisture retention and cooler soil temperatures, both of which favor optimal root growth. If done properly, mulch is a great asset to your landscape and aids your trees during summer drought periods by maintaining soil moisture. It also helps insulate the roots during the winter months, which allows them to remain active longer into the season. Need to figure out how much mulch you need for your project? Try out the handy Michigan Gardener soil and much calculator. I am often asked when is the best time and what should be pruned. The ideal time is when the tree is dormant, which is late fall to early spring. Since the tree is not active, the removal of limbs will be less stressful to the plant. It is also easier to see the structure of the tree without its leaves to better find problem areas like rubbing branches, weak crotches, cracked or broken limbs and competing leader branches. The tree will have more time to seal the wounds before the growing season starts and there will be less sap running from the wounds. Also, insect and disease organisms are not active at this time, so it reduces the risk of infection or pest infestation, which is why birches and American elms should only be pruned in the winter. The worst time to prune trees is late spring and early summer when their leaves are expanding and the tree is putting its energy toward growth. A common myth is that large, mature trees can tolerate more pruning than small trees. In fact, the opposite is true. Only the outside inch or two of a tree is alive; the rest is made up of dead cells whose main function is to support the tree. That’s why a tree can be hollow but still be perfectly healthy. If you compare the percentage of live cells to dead cells between a small tree and mature tree, the difference is huge. A young tree might be made up of 90 to 100 percent live cells, while an old, mature tree might only have 10 percent or less. As you can imagine, the younger tree has a better chance to adjust to change. A good rule for mature trees is that less is better. Try to avoid removing large limbs over 6 inches in diameter because it will be difficult for the tree to close the wound before decay sets in. Other options are cabling or thinning these large limbs as opposed to removing them. Good maintenance items for mature trees are removing deadwood and hazard limbs and thinning for weight reduction when necessary. Young trees up to 8 to 12 inches in diameter need to be pruned properly for structure while they are still young to avoid the need to remove large limbs in the future. When pruning trees, keep in mind that the leaves produce the energy for the plant and that removing too much leaf surface from a tree or limb will starve the plant, causing die back or heavy sucker growth from that part of the tree. “Topping” trees destroys them. They will never grow back to their natural shape and every branch that grows out of that wound area will be an accident waiting to happen. As the new limbs grow bigger and the rot in the wound increases, the branch will eventually break. A topped tree soon becomes a maintenance headache, with constant storm damage due to the weak branch attachment. If a tree is too large for its location, consider having it removed and replanted with a smaller species rather than topping it. It is important to know what a tree’s natural shape will be when it matures before you prune it. For example, I see many weeping cherries that are pruned into a ball shape because all of the upright limbs were removed as they grew out of the top. If allowed to continue growing, these limbs would have eventually bent back down, creating the weeping effect that gives the tree its unique look. So it pays to do a little homework and find out what the tree’s natural shape is and help it reach its full potential. Not all ornamental trees need to be pruned into the traditional lollipop shape! When it comes to shrubs, prune flowering shrubs soon after they are done blooming. Non-flowering shrubs and evergreens can be pruned as necessary to achieve a desired shape. Keep in mind that wider at the bottom is better than narrow — if you allow more sun to reach the bottom of the shrub, the plant won’t thin out as much. Avoid heavy, late summer pruning; too much pruning at this time will encourage new growth that may not harden off in time for winter. For those plants that don’t tolerate shearing well, like red or green twig dogwoods, it is best to prune them back to the ground when they become too large or sparse, and let them start over again by growing new limbs from the base. There seems to be a growing trend toward using organic products versus manmade, synthetic products in the garden industry. Today, many consumers are more educated and aware of the benefits of more natural solutions to common garden problems, rather than to rely on the quick fix of a synthetic product. Chemical companies are responding by offering more eco-friendly products than ever before. When you walk into a garden center you will find a host of newer products to help control insects and diseases right next to the old standbys. Some synthetic pesticides are being phased out due to increased government regulations and others are not available to homeowners anymore. So how do you know what to buy for your problem and does it really work? And is an organic product really safer? First of all, there seems to be a misconception that all organic products are safe. While in most cases this is true, keep in mind that the definition of “organic” denotes a compound that contains a carbon molecule. Arsenic and lead meet this definition and yet are very toxic to humans. You still need to read the product labels, use the products as directed, and follow the safety procedures—organic or not. Toxicity is measured in how many parts per million of a substance it takes to be toxic to humans. Table salt can be toxic to humans if enough is digested at once. A product that has a low toxicity means that it will take a lot more exposure to that product to have negative effects than one with a higher toxicity level. Most organic products will do what they are labeled for if applied properly. Some might need to be applied more frequently than synthetics because they break down quicker. Others will out-perform synthetics because of their ability to be absorbed by the plant and to have a longer residual effect. Garlic oil – Garlic works by repelling insects, not killing them. It is mixed with water and sprayed on plants, and is absorbed into the leaf tissue where it can remain effective for up to 30 days. It works well at repelling mosquitoes, bees, flies, ants, spider mites, and other flying insects. Do not use on plants that need bees to pollinate them, i.e. vegetable gardens. Neem oil – Derived from the neem tree, neem oil has many medicinal purposes and is well-known for its natural resistance to insects. It works by repelling insects, prohibiting eggs from hatching, and interfering with insects’ molting process. It works against a wide variety of chewing and sucking insects. It also has anti-fungal and anti-bacterial properties that can fight disease. Effective on blackspot for roses and white flies. Chile extract/Mustard oil – Kills on contact and repels nematodes, fungi, insects and slugs. Works well on grubs and harmful nematodes. Pyrethrins – This extract is from the chrysanthemum plant and is used in many products. It works by killing insects on contact. It has a low toxicity to humans and animals, and controls a large variety of insects. A common ingredient in flea collars. Diatomaceous earth – Ground up seashells. Harmless to humans, works because its abrasive form breaks down an insect’s outer defense and then causes desiccation due to its highly absorbing qualities that dry up an insect’s bodily fluids. Ants, cockroaches, plant bugs, aphids, caterpillars and many more. Beneficial nematodes – Work by attacking grubs and other insect larvae in the ground. They are a parasitic organism that can survive for many years in the soil without a food source. They work very well against grubs and black vine weevils. Fish oil – Works by suffocation, just like horticultural oils. The advantage is that it is not petroleum-based and it contains many beneficial nutrients and vitamins that break down to fertilize the plant. Petroleum-eating microbes – Great for accidental gas or oil spills on property. These microbes actually eat petroleum products and convert them to harmless carbon molecules. Citric acid/Mint oil – Anti-fungal and anti-bacterial. Can be used against a wide variety of pathogens including Phytophthora. Grapefruit seed extracts – Anti-fungal and anti-bacterial. Can be used against a wide variety of pathogens. Works as a barrier preventing diseases from getting started on plant foliage. Hydrogen peroxide – Kills fungus on contact, literally melts the spores into jelly, then breaks down in the soil and releases oxygen. Works well on powdery mildew. A disadvantage is that it is very corrosive to metal. Pepper sprays – Can kill some soft-bodied insects like aphids and is used to repel others. Also used to deter rodents and deer from gardens. Can be an extreme irritant to skin and eyes. Milky Spore – A fungus that attacks grubs. Works well and has a long residual in the soil. Works so well that the company almost went bankrupt due to the lack of need for repeat sales in the 1950’s. Mycorrhizae – A soilborne fungus that colonizes the roots of plants and prevents many soil pathogens from attacking the plant they are growing on. Works well against fusarium blight on lawns and many others. Great for preventing disease in seedling production. Being an arborist is a lot like being a good detective. You get a call saying there is a problem with a tree. You ask the client questions to gather facts about the tree’s history. Then you go to the site and look for clues to the problem and ask more questions if needed. Sometimes the situation is obvious and other times it can be a real challenge, but most tree problems will fall into three categories: insect, disease, or environment. In many cases, it is a combination. As you have heard many times before, healthy plants are more resistant to insects and disease, but what about environmental stresses? Even the healthiest plant can’t guard against weed whackers or backhoes trenching through its root system. Nine times out of ten, it is an environmental stress that leads to the insect or disease attacking the plant. This is what confuses many homeowners. For example, they see leaf scorch and want to spray it to solve the problem. However, the leaf scorch can merely be a symptom, not the main problem. Both the weed trimmer and backhoe stress examples above could cause leaf scorch or leaves to drop, but they are two very different problems that spraying would have no effect on. You must find signs to diagnose a problem and treat it correctly; symptoms only let us know that there is a problem. 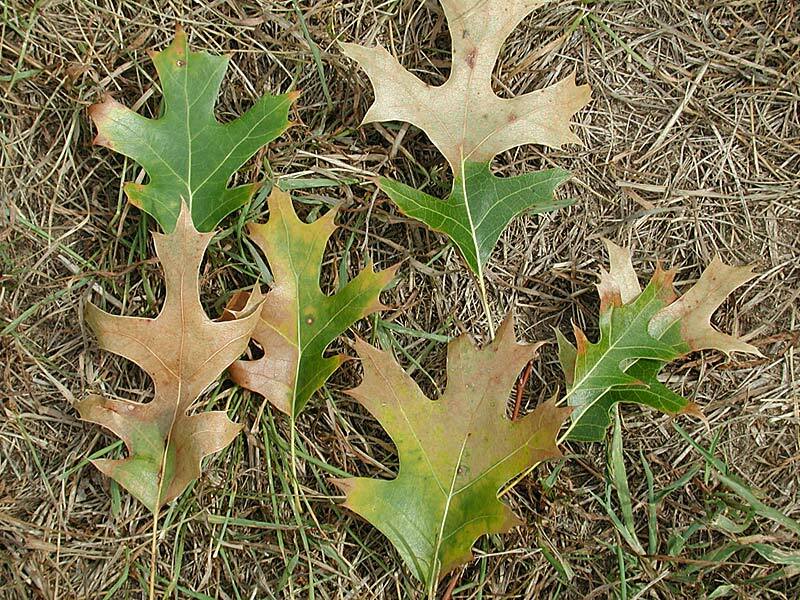 A chewed leaf is a symptom unless the feeding pattern is unique to a certain type of insect; then it is a sign. A birch tree dying at the top is a symptom, but the D-shaped exit hole on the trunk is a sign that borers are present. Now you can begin to understand how many times diseases and insects are only the symptoms of the environmental stresses that are the real problem. Too often only the symptoms are treated, without addressing the real issues that are causing the problem. A good example is leaf miner on birch trees. If you keep the tree well-watered, mulch around the root zone, avoid planting it on a berm or top of a hill, and fertilize it once a year, it will stay healthy for a long time. On the other hand, plant it in the wrong place, don’t water, mulch, or fertilize it, and you will spend quite a bit of money each spring spraying to keep it healthy. Unfortunately, what happens too often is that the obvious problem gets treated without the root cause being addressed, which can lead to unnecessary expense and use of pesticides. Environmental stresses are very common, but can be difficult to identify. They include drought stress, improper pH of soil, girdling roots, salt build-up in the soil, lightning strikes, herbicide damage, root confinement, bad drainage, compacted soils, improper planting, change of grade, root disturbance, and many more. Some can be corrected and some cannot. It helps to know what you’re up against before you decide a course of action and whether to treat just the symptoms or try to fix the real cause. The good news is that today we have more options than ever in treating stressed plants. Not too long ago, tree care consisted of spraying everything three times a year, whether it needed it or not, and fertilizing in the fall. This hit or miss approach has become outdated and even irresponsible. As the public awareness of pesticides has grown, so has the demand for safer and more environmentally sound treatments. In recent years, science has developed more biological controls than ever before. Products such as Bt, which controls caterpillars by infecting them with a virus, are becoming the preferred choice as opposed to broad-spectrum insecticides that kill both good and bad insects. Recently a nematode was introduced that will attack grubs and termites in the soil without affecting earthworms and other beneficial insects. They will live in the soil for years with only a single application and eliminate the need for multiple applications of pesticides on lawns, reducing the risks to both children and animals. Another product is a fungus that is antagonistic to the Dutch elm disease fungus. It has shown much promise and could mean the return of the beautiful elms that once lined so many of our streets. Mycorrhiza use has grown by leaps and bounds in recent years as arborists have discovered the many benefits they provide to our urban trees. This beneficial fungus attaches itself to the roots of plants and creates a second root system that is much more efficient at absorbing water and nutrients for the plant. It also guards against harmful soilborne pathogens that otherwise could attack the plant. It will also increase drought and salt tolerances, increase fruiting and flowering in many plants, and reduce transplant shock. Mycorrhizae have been around for millions of years working in a symbiotic relationship with plants in forests and meadows, but in our urban landscape they have been reduced by many common cultural practices. By reintroducing them to our urban trees, we help reestablish this natural, beneficial relationship. I know you have all read the pamphlets and have probably done it a few times, but it never hurts for a little review. If I had a dollar for all the improperly planted trees I have seen over the years, I would be rich! First, dig the hole as deep as the root ball and at least twice as wide. Be sure to not dig too deep; a good way to prevent this is to measure the root ball against the shovel handle and check it often when digging. If you do dig too deep, remember to pack the soil firmly under the ball to prevent settling once the plant is in place. This is more important for trees than shrubs. On the other hand, if the hole is not deep enough, keep digging. Don’t make the mistake of planting high and then mounding soil up around the root ball, even in clay soils. One exception is a compacted clay subsoil, which can be found in new subdivisions. If you can’t dig deep enough, then add a lot of topsoil around the top of the root ball to make a gradual decline down to the grade level. After the tree is in the hole, cut and remove as much of the wire cage (if present) as possible. Any part that you can’t remove should be cut and bent down. Untie the twine around the trunk and pull down the burlap. If the burlap is in good condition, push it to the bottom or cut it out. If it is old and roots are growing through, then leave it and make several vertical slices instead. If you are planting potted shrubs, carefully remove them from their pots and make several vertical slices down the root ball. Grab the bottom of the roots and pull them back up like peeling a banana and set them in the hole with the cut sections pointing out. Next, begin to backfill using the same soil that came out of the hole, making sure to break up any large chunks of soil. There should be no large air spaces left behind as you fill. Stop about 6 inches from the top and add fertilizer to the remaining fill, preferably either slow release or organic fertilizer that is low in nitrogen. Complete backfilling to grade level. When planting trees or large shrubs, do not mix soil amendments such as sand, peat, or topsoil to the fill. These work better as top dressings. They actually create a false environment within the planting hole and do not encourage outward growth of the roots. Instead, the roots tend to wind around in the hole, which can eventually lead to girdling roots. Also, drainage can be a problem with dissimilar soils. Water will not move from one soil type to another until the first is completely saturated. This is why it is important to check the soil of the root ball before you buy the plant. Ideally, you should not plant trees grown in sand in clay soils and vice versa. It can only cause problems in the future. Now that the plant is in the ground, water well and keep the soil moist for several weeks, but do not overwater. Before watering, move aside the mulch and feel the soil to verify it isn’t too wet before adding more water. Keep the mulch away from the trunk of the plant and do not add too much mulch — 3 to 4 inches is plenty. Let’s discuss a leading cause of premature death and decline of many of our landscape trees. It’s not an insect or a disease although it can make them more prone to both. It is easily prevented and in many cases can be corrected. It can kill some trees relatively quickly and others over decades. What is it? Improper grade around the tree. I’m not talking about the root ball and if it is above ground or not. What I am concerned about is where the root flare is in relation to the soil grade. Can you see the roots as they enter the soil? Can you even see the taper of the trunk? Some trees look like sticks or telephone poles coming out of the soil with absolutely no visible flare at all. These are sure indicators that the plant is too deep, has girdling roots, or both. Think about trees growing in the forest, and how they appear to be “standing” on the soil as opposed to being buried in it. You can easily see the root flare and often the roots themselves as they enter the soil. Now look at your trees – do you see any resemblance? Unfortunately many of you will not. That is because for years people were told to plant trees deep to create a deeper root system to “help keep the tree from blowing over” or to “keep the roots out of the lawn.” Both reasons seem logical and have their short-term benefits, but in the long run they will decrease the life of the tree. Another factor is grade change around trees during development. Fill dirt is often spread to even out the grade of the land, and mature trees can be buried beyond their natural root collars. This can affect both naturally-grown trees and those we have planted, but it will not always affect both of them in the same way. Soil structure also plays a role in the time in which a problem will occur. Heavy clay soils will speed up the process while sandy soils can take years to have an impact. When a tree has soil placed on it above its root collar, usually one of three things will occur. First, the tree will send out new roots from its buried trunk. If the soil is sandy, they will normally grow away from the trunk, but if the soil is clay, odds are the roots will turn and circle the tree (this is what we call a girdling root). As the tree grows these roots will eventually end up pressed against the trunk, restricting the flow of water and nutrients up to the tree as well as the reverse flow of sugars down to the roots for storage and root growth. This girdling root has been cut to relive pressure against the tree trunk and allow better movement of water and nutrients up the tree. The second problem occurs when the soil around the tree is so compacted that it will not let the tree expand, and starts to restrict it. This can happen when new trees are planted too deep in compacted clay soils. Or it can happen to older, mature trees that were filled around long ago. After decades of the tree growing and pushing the soil back, it has caused the soil to compact around it so densely, it’s almost like cement pressed against the trunk. I recently worked on a large white oak that had 10 to 12 inches of sand filled around it in the 1920’s when the house was built. When I removed the soil around the trunk, the sand was so compressed it came out in chunks that looked like sandstone. It was amazing to see how compacted it had become after 80 years of pressure. The third thing that can occur usually affects young trees and trees with thin bark like linden, beech, cherry, birch, and mountain ash. They develop cankers along their trunks that can lead to decay in the future or kill so much of the cambium that the tree declines. Trees release gasses through their bark and if it is covered by soil, it can disrupt this process and cause a build up of toxins under the bark, which can lead to cankers. I have seen trees of all types and ages that are too deep, but a large majority seem to be trees planted in the 1970’s and later. Even trees planted above grade can be affected if the soil is mounded too far up the trunk. I think a lot of this has to do with how many times the tree is handled before it is planted. Once a tree is dug from a field it gets balled in burlap and it is difficult to see the original grade at which it grew. Next, it will be buried in mulch until shipped to the nursery, and once it gets there it is reburied in mulch until someone buys it. Each time it is handled it has more mulch piled up against it until the original grade is lost on the top of the ball over time. When the homeowner or landscaper plants the tree they look at the new grade of the tree instead of pulling back all the mulch and built up soil that has accumulated and untying the ball to check the original grade. So the tree is sometimes 6 to 10 inches too deep right from the start. More soil is often added around it or the tree can also sink in the hole, making the problem even worse. Finally, if the tree has mulch piled against the trunk, it will only add to the problem as the mulch breaks down and adds more soil above the original grade. So no longer can we just measure the root ball and dig a hole, time should be taken to uncover the trunk and search for the first lateral roots before the hole is dug. I know many of you are thinking “my trees look like they could be planted too deep but are doing just fine, so what’s the big deal?” Trees are very resilient and can take years to show the effects of past damage. Rarely is the original problem associated with the decline because so much time has passed until the symptoms become apparent years and years later. What you do to your tree today will not show up for years to come, but it will have an impact on its longevity. If you think your tree might be planted too deep and has been in the ground too long to replant, there are some things that can be done to restore the grade. An arborist’s tool called the Air-Spade uses a high pressure stream of air to remove soil around the base of the tree and inspect the roots and trunk below grade. Although powerful, it is still very gentle around trees. It will remove even the most compacted soil but will not disturb the roots; even the small feeder roots will remain intact. Once the soil is removed we can get a better idea of what is going on below grade. If the root system is a tangled mess or the tree has grown into the wire basket, or even has started to decay from old cankers, at least you will know for sure what the problem is instead of simply making guesses. I recently uncovered the roots of a dogwood that had been declining for several years. Several companies had tried different treatments with no success. When I looked at the roots, it was clear why the tree was not responding – they looked like a tangled ball of knots and the tree was about a foot too deep. Unfortunately, there was little hope to correct this tree, but at least the homeowner now knew why and could avoid wasting any more money on it, while focusing their attention on what to replace it with. Many trees will improve by just lowering the grade and installing a well around them if necessary to keep the soil away from their trunks. Some trees may have a couple of girdling roots crossing their trunks and they can usually be removed without causing too much stress on the tree. Steve Turner is a Certified Arborist from Arboricultural Services in Oakland County, Michigan.